Speaking skill is affected by two factors, the internal and external factors. The two external factors are instructional methods and learning resources. The complete and incomplete learning resources will surely affect the instructional process. As well as with instructional methods, it will affect the achievement of learning objectives. 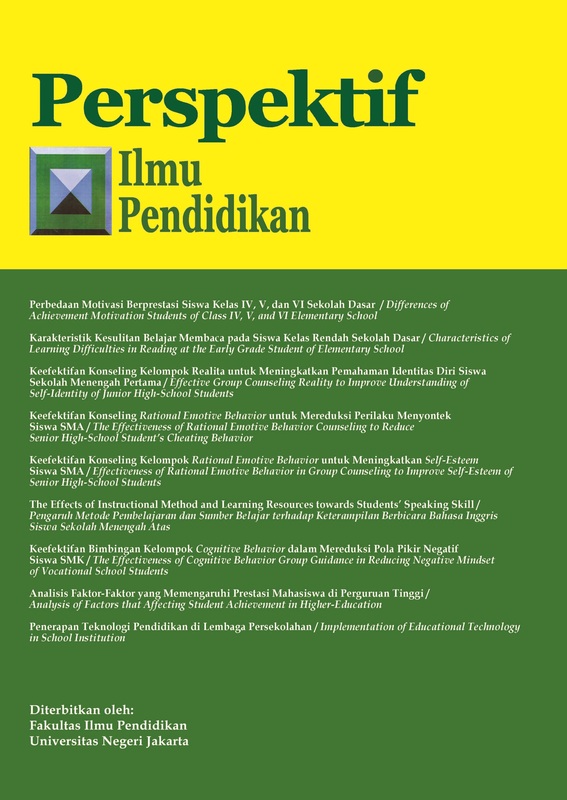 This research is aimed to get the empirical data and to find out the effect of instructional method and learning resources towards students’ speaking skill at state senior high schools in Bekasi. The research was conducted at SMA Negeri 1 and SMA Negeri 2 Sukatani-Bekasi. The total sample of this research is 40 students. The experiment was done from 17 Juli – 02 December in 2017. The technique of collecting data of instructional method and learning resources used questionnaires. Otherwise, the speaking skill was acquired from the test. The result of the research identifies there is the significant effect of instructional method and learning resources towards students speaking skill. Thus, the schools and the government should increasingly work hard in fulfillment of the completeness of learning resources and using an appropriate instructional method for the achievement of learning objectives. Brown, H. D. (2004). Language assessment, principle, and classroom practice: Fourth edition. New York: Pearson Education, Inc.
Cameron, L. (2001). Teaching language to young learners. Cambridge: Cambridge University Press. Chaney, A. L., & Burk, T. L. (1998). Teaching oral communication in grades K-8. Boston: Allyn and Bacon. Hughes, D. (2007). Public speaking. Jakarta: Gramedia Widiasarana. Keown, M. P. (1976). Reading a basic guide for parents and teacher. Singapore: Routledgeand Kegan Paul Ltd.
Muhroji, dkk. (2004). Fasilitas belajar mengajar. Jakarta: Rineka Cipta. Nurhayati & Mufliharsi, R. (2016). Perencanaan dan pengajaran bahasa Inggris. Jakarta: UNINDRA PRESS. Nurmalia, E. (2010). Pengaruh fasilitas dan lingkungan belajar terhadap prestasi belajar siswa kelas XI IPS MAN Malang 1. Skripsi tidak diterbitkan. Malang: Universitas Islam Negeri (UIN) Maulana Malik Ibrahim Malang. Richards J.C., & Rodgers. (1986). Approaches and methods in language teaching. Cambridge: Cambridge University Press. Sudjana. (1996). Metode statistika. Bandung: Tarsito. Setiyadi, B. (2006). Teaching english as foreign language. Yogyakarta: Graha Ilmu.